In July of last year, San Diego's five Congressoinal members sent a letter to USFS director Thomas Tidwell asking him to land the tanker planes at Ramona. 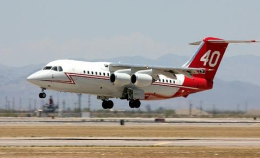 Supervisors then voted unanimously to ask President Obama to order the USFS to allow its tankers to take off from the Ramona Air Base to fight fighters, as ECM reported. Had those pleas been heeded, the Border Fire might well have been contained early on without mushrooming out of control, threatening homes and lives in communities across the southeast portion of San Diego's East County. San Bernardino, Are they nuts?? Come on USFS put on your thinking caps. Ramona is the most logical place to load up retardant rather then waste precious flying time going all the way to San Bernardino. As you well know once these fires get a strong hold ever second counts. Shut down the airport except for emergency flights and make the airport top priority to fire fighting activity only. The Border Fire very well could have escalated into another Cedar Fire and more lives could have been lost. I'm not a fire fighter, but the quicker these wild fires are addressed the quicker they are extinguished. I hope it wasn't politics that entered into this equation as this blaze cost lives. We now know 2 people died the first day of the fire. Every second counts in these life or death situations. Would they be alive today if the tanker didn't have to come from so far away? Could any of those 5 homes have been saved? We'll never know. What's the difference in flight times? I'll bet the airport in SB has more take offs and landings, causing more delays.